The term organic sometimes confuses people. To a chemist, organic means a carbon molecule is present. All natural materials that contain carbon are organic. Everything in your garden from a living source is organic. Natural means something different and broader. Some of what is in your garden is natural but not organic. Sand, for example, comes from rocks ground to a fine texture. It does not come from a living source or have no carbon. Sand and stones are natural but not organic. Organic when applied to gardening means something more complex than carbon. To deserve the label organic, your garden soil must have no synthetic pesticides, herbicides, fertilizers and genetically modified organisms (GMOs). 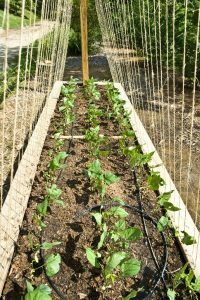 In your backyard garden, you grow a small crop for your personal use. Whatever methods you use, you may call your garden organic. In your backyard or community plot, you may do anything you want to your plants. You grow things, but you are not a grower. Organic growing produces food to sell. All organic produce grown and distributed in the U.S. must follow strict guidelines set by the USDA (U.S. Department of Agriculture) or private certifying agencies like the C.C.O.F. (California Certified Organic Farmers) and OMRI (Organic Materials Review Institute.) These certifying agencies assure farmers do not use anything synthetic or unsafe for human exposure. Growers who adhere to these agency’s rules can be certified as organic. Certification matters to commercial growers who must prove they are growing by accepted standards in order to label their produce organic. For the home gardener, certified is a useless term. Certification should matter to you only when you go to a farmer’s market or a grocery store to buy organic produce you cannot grow yourself. Organic produce, regardless of its source, is grown according to the certifying agency’s standards which include no use of or exposure to synthetic (non-organic or non-natural) herbicides, pesticides, fertilizers or GMOs. Do not uncritically accept everything labeled organic. Unless you know organic practices and techniques, you cannot know the effects your methods will have on plants, people or your environment. To be safe and successful as a gardener, you should understand how and why organic is good and when it is not. For example, if too many microbes are applied in an organic fertilizer based on chicken manure, it acts like a synthetic fertilizer. The excess microbial action digests the organic fertilizer too quickly, making the soil lose nutrients before the plant roots can absorb them. The best thing to do is read the labels and ask questions about the source of anything you apply to your soil and plants. If you cannot quickly identify an ingredient on the label, don’t use it. 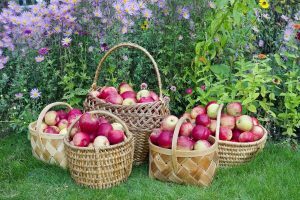 While organic gardeners agree on avoiding synthetic pesticides, herbicides, fertilizers and GMOs, they otherwise follow a variety of gardening rules. 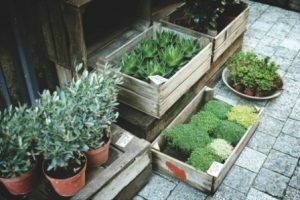 On the strict side, organic gardeners believe a plant should not receive any type of nutrient beyond what is native to the local area. A more liberal approach allows treating the soil, feeding the foliage and introducing treatments that control temperature and light availability. Regardless of approach, the organic gardener knows their local soil, plants and animals by getting close to the environment. He or she also needs to be inquisitive, practical and attentive to detail. In his highest ideals, he cherishes the health and well-being of his family, community and world. People give five main reasons to choose organic gardening. The best, most nutritious food is picked ripe and eaten fresh near where it was grown in healthy soil. Organic methods reduce human exposure to potentially harmful chemicals, especially for infants and children. The increasing demand for organically grown produce shows people have a strong desire for healthy, safe food. You can be confident the food you grow is free of chemical residues and other pollutants from commercial farming. Also, organic methods do not lead to lower yields or lower quality. With the right type of organic approach you may well increase both. Organic methods cultivate the soil and modify it, leaving it better, more fertile than you found it. Organic works organic materials back into the soil until microorganisms use it as an energy source. The energy then passes in diverse compounds for actively growing plants to use. When animals and humans consume these plants, carbon dioxide is sequestered that would otherwise release into the atmosphere. Even your small backyard garden makes a difference at the global level. Sound organic methods safely mimic the life processes of the natural world, support habitat for wildlife and keep a balanced ecosystem. Healthy plants naturally resist pest and diseases in two ways. First, the thicker a plant cell wall, the more it resists infec­tion and insect attack. Second, a weak and susceptible plant transmits an electro-magnetic signal in a frequency range that destructive insects can detect, calling them to come and eat it. Healthy plants do not invite pests so easily. Do not strive for perfection. Plants do not naturally grow to the beauty standards of perfection (no spots, smooth com­plexion) you see in a supermarket produce section. You can still have high yields and eat nutritious, healthy produce without pursuing the impossible goal of exterminating all pests, diseases and weeds. You cannot conquer Nature. Instead, live in harmony with it. 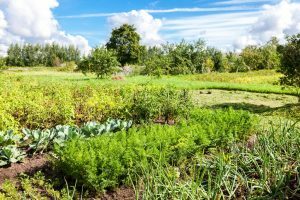 As an organic gardener, you can manage disease and pest problems in a way that is non-toxic, sustainable and gratifying. The organic approach uses strategies that blend with natural processes to control pests and disease. For example, if an insect lands on an organically treated tomato plant, the pungent odor of garlic extract and strong essential oils such as rosemary or clove will induce it to fly or crawl away from a plant it normally feeds on. Some of these natural insecticide components are made by grinding raw plant materials, such as flowers, roots, stems or seeds. Others are extracted from plant materials, then refined and purified into essential oils. confuse the pests’ smell receptors (often located on their feet). Essential oils also make pest habitats inhospitable. They coat and suffocate insects, fungi and scales. Additionally, essential oils also reduce the number of pest eggs laid and the amount of feeding damage caused by a broad range of pests. Most plant pathogens are fungal. If you limit or remove the environment that encourages fungus to grow, you minimize their ability to thrive and destroy a garden. For example, dark and damp soil under an overhead sprinkler system is the perfect environment for fungus. By contrast, if the soil contains enough organisms that feed on fungus, many fungal spores will be eaten before they can grow and spread. Keep soil well-aerated and evenly moist to help control fungal pathogens and discourage harmful bacteria. Fungi are some of the worst enemies in a garden. Pythi­um and rhizoctonia (damping-off), thielaniopsis (black root rot), and other root rot and wilt organisms such as fusarium and phytophthora, can quickly destroy an entire garden. The safe, organic control method uses a natural process called general suppression. Healthy soil is full of beneficial bacteria such as Bacillus subtilis and Bacillus megaterium. Further, it has mycorrhizal fungi, which suppress fungal pathogens. To make sure your soil is not deficient in any of these, you can apply naturally occurring antibiotic compounds, such as soil probiotics. These beneficial organisms are sold in vari­ous organic fertilizers, soils and soil inoculants that suppress pathogens through antagonism, competition, predation, and induced resistance. Biodiversity is another key factor in organic control. The living variety of organisms in the soil, both micro and macro, helps regulate fungal pathogens and insects. Beneficial nematodes, mites, and mycorrhizal fungi also fight pest and disease problems. The first step is to grow strong and healthy plants in the best soil. Not all conditions warrant the use of insecticides or fungicides. Pests can become resistant to chemical treatment. Consider these alternatives. Natural methods manage and prevent harm to plants by pests or diseases. The first step is to identify the disease or pest when they are active. Then you can develop ways to minimize the damaging effects. Here are a few. Some pests crawl along leaves, eating them or using them to lay their eggs. Catching and removing pests early, while requiring more labor, can prevent exponentially escalating problems. Some pests, like slugs and snails, are more active on damp nights, while others are active during dry sunny days. Some pests can be rinsed off plants with a powerful stream of water. Attachments that hook up to your hose are designed to blast bugs off foliage. Removing pests by hand or rinsing is better than spraying, especially near ponds, streams or lakes, since pesticides can injure or kill aquatic life. Remove badly infested or diseased plants to minimize spreading to healthy neighboring plants. Put infested or dis­eased plants in a closed plastic bag and remove them from your property to minimize contamination. Never place any­thing diseased or infested back into your soil. Put it into a municipal green waste composting container, if possible. If nothing else, bag it and trash it. Install barriers, which are available in several different types, to protect smaller plants from birds or animals, build a small frame around the plant and enclose the area with mesh netting. You can also cover groups of fruits like apples or pears with pantyhose or tights to stop insects or birds from feeding on your freshly ripe fruit. Place cut-off plastic bottles around smaller plants to help protect and warm up the soil around the roots. This pro­motes microbe activity. Row covers made from material with small holes can protect entire rows from birds, beetles, bad worms and maggots. Cabbage maggots like to lay their eggs in the soil right around plants. You can deter them by placing a collar made of cardboard or other fabric around the stems. This causes females to lay their eggs on the collar where the eggs will dry out before hatching. Pheromones are gaseous chemicals that insects and animals use to communicate, locate plants or find a mate. A trap can attract pests so you can monitor when they are active and most destructive. You can then determine the best time to apply a pesticide or other method to stop the offspring from causing plant damage. Sticky traps used in various locations can stop pests cold. Non-flying insects travel up and down plants such as trees. Placing a sticky band around, but not touching, the tree trunk will deter pests from reaching the fruit. You can also place other sticky bands around containers to stop bugs like ants or earwigs. Traps can be hung above plants in greenhouses to capture flying pests. This step indicates the extent of the invasion. Additional controls may further deter plant damage. Other traps such as half-full cans of beer can be buried at soil level near plants to attract slugs and snails. They fall in, get drunk and drown. Repellents usually deter birds, deer, rodents and moles by using bothersome smells, tastes or noises these animals do not tolerate. Soaps, oils and noise repellents are available at many nurseries. For getting rid of moles or gophers, try this trick. At your local barbershop, ask for some cut hair they normally sweep up and discard. Place the hair in the rodent’s hole. Gophers and moles will sense a human is down there with them and avoid your garden. Buried hair also breaks down into nitrogen-rich fertilizer. Here you recruit the help of pest predators or spraying pests with living organisms. Remember the checks and balances of biodiversity. But if the balance is off, you can use these techniques. Releasing pest predators like ladybugs and praying mantis are a good, safe approach. Planting flowers and other shrubs around the garden can attract and provide shelter for pest eaters such as birds, frogs, toads, bats and certain insects. This is called companion planting. A small body of water nearby, such as a pond, provides a breeding ground for creatures like frogs and toads. If you add pest predators, avoid following it with an insecticide, which can kill off the predators and be a waste of money. If you must spray, do it first, and release predators a few days later. Beneficial microbes – Bt, or Bacillus thuringiensis – can safely control lepidopteron larvae (caterpillars.) This is one of the most effective ways to get rid of leaf-chewing pests. Different treatments operate best under certain environmental conditions. For instance, Bt is less effective when applied in direct sun. Caterpillars feed only in warm weather, so apply Bt when it is warm, but not in direct sun, to maximize its potential. Early morning is the best time to apply. Botanical sprays use essential oils like cinnamon, clove, mint, rosemary, eucalyptus and wintergreen oil to kill and control a wide variety of pests by immobilizing them. These substances kill by blocking chemical signals that control body functions. Botanical oils are completely derived from plants. They quickly break down to harmless substances that do not damage the environmental. Garlic extract also repels pests. Most pests have their smell receptors on the bottom of their legs. When they land on a plant that has been sprayed with essential oils or garlic, they detect an aroma different from their target plant and move on to neighboring plants. Use these as a last resort when nothing else has worked. If you have a biologically diverse garden, you may never need a toxic chemical to control pests or disease. However, if you do use chemicals, read the label carefully and never over apply. More is not better. Remember that insects develop resistance to pesticides, requiring stronger and more frequent applications to be effective. Toxic pesticide use may be detrimental to the environment and severely disrupt the balance of living organisms in the soil. Pesticides can also be pollutants of groundwater, lakes, rivers and oceans. While more detrimental on the large-scale farm, using synthetic pesticides in your backyard can also dam­age the environment. Consider using a chemical only when nothing else will work to save your crop. Unfortunately, in some cases you don’t have a choice between using chemical treatments and letting Nature take its course. When an infestation grows out of control, the only quick way to get rid of pests may be to use an extermination spray. Fortunately, some well-developed treatments have minimal side effects when used properly. Pay close attention to the plant toxicity of each method to avoid killing the plants you want to salvage. Never spray a plant with any treatment in direct sunlight. Even the safest of treatments can be harmful if applied in direct sunlight. Treating plants is sometimes like treating people. You can treat the symptoms or think more deeply about the cause of a disease. The same symptom and disease relationship holds true for plants. If the soil is healthy and full of biodiversity, you can prevent disease instead of treating symptoms. This article is an excerpt from Home Grown Food by Milo Shammas, the founder and CEO of Dr. Earth Advanced Organics a supplier of organic soil, nutrients and pest control products. For more information visit DrEarth.com. Learn more about his books at MiloShammas.com.